Oxalis corniculata, the creeping woodsorrel, also called procumbent yellow-sorrel or sleeping beauty, resembles the common yellow woodsorrel, Oxalis stricta. It is a somewhat delicate-appearing, low-growing, herbaceous plant in the family Oxalidaceae. It has a narrow, creeping stem that readily roots at the nodes. The trifoliate leaves are subdivided into three rounded leaflets and resemble a clover in shape. 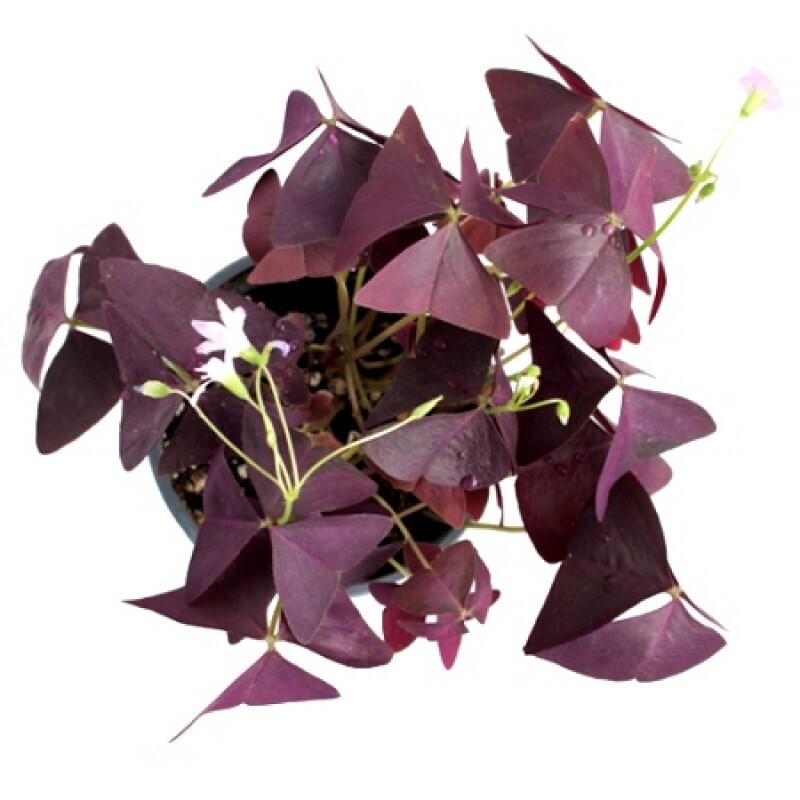 Some varieties have green leaves, while others, like Oxalis corniculata var. atropurpurea, have purple. The leaves have inconspicuous stipules at the base of each petiole. The leaves of wood sorrel are quite edible, with a tangy taste of lemons. A drink can be made by infusing the leaves in hot water for about 10 minutes, sweetening and then chilling. The entire plant is rich in vitamin C. Any wood sorrel is safe in low dosages, but if eaten in large quantities over a length of time can inhibit calcium absorption by the body. The leaves contain oxalic acid, which gives them their sharp flavour. Perfectly all right in small quantities, the leaves should not be eaten in large amounts since oxalic acid can bind up the body's supply of calcium leading to nutritional deficiency. The quantity of oxalic acid will be reduced if the leaves are cooked. People with a tendency to rheumatism, arthritis, gout, kidney stones or hyperacidity. Leaves - raw or cooked. Added to salads, cooked as a potherb with other milder flavoured greens or used to give a sour flavour to other foods. The leaves are available all year round unless the winter is very cold, they have a pleasantly sour taste, but are very small and fiddly to harvest. The leaves contain about 86% water, 2.3% protein, 0.8% fat, 8.2% carbohydrate, 150mg calcium, 78mg phosphorus, 8mg iron, 0.6mg niacin, 78mg vitamin C, 6050µg beta carotene. The leaves contain between 7 - 12% oxalate. Use in moderation, see notes at top of sheet, Flowers - raw. A nice acid flavour and a pleasant addition to the salad bowl. The whole plant is anthelmintic, antiphlogistic, astringent, depurative, diuretic, emmenagogue, febrifuge, lithontripic, stomachic and styptic. It is used in the treatment of influenza, fever, urinary tract infections, enteritis, diarrhoea, traumatic injuries, sprains and poisonous snake bites. The juice of the plant, mixed with butter, is applied to muscular swellings, boils and pimples. An infusion can be used as a wash to rid children of hookworms. The plant is a good source of vitamin C and is used as an antiscorbutic in the treatment of scurvy. The leaves are used as an antidote to poisoning by the seeds of Datura spp, arsenic and mercury. The leaf juice is applied to insect bites, burns and skin eruptions. It has an antibacterial activity. A slimy substance collects in the mouth when the leaves are chewed, this is used by magicians to protect the mouth when they eat glass. Yellow, orange and red to brown dyes are obtained from the flowers. The boiled whole plant yields a yellow dye. A very easily grown plant, succeeding in a sandy soil in a warm dry position. It prefers dry open habitats. Spreading rapidly by seed and underground bulbils, this species can quickly become a nuisance, it is a common weed of pot plants in nurseries. Seed - best sown as soon as ripe in a cold frame. This plant does not need any encouragement.